Back when I first got interested in learning about food and foodways, I discovered the pleasure of reading well-written cookbooks by chefs with a point of view. I read them cover to cover like a novel – focusing on the commentary and comments. I generally skim over the individual recipes, making note of particular dishes I might like to come back to and tackle at some point. In the last year I haven’t had a lot of time to check out cookbooks. However in the past month I made the time to read two great ones by two Southern chefs whose food I’ve had the pleasure of enjoying at those wonderful Alabama Chanin dinners at the company’s Florence factory. Vivian Howard was the chef for my first Friends of the Café dinner. At the time the PBS show A Chef’s Life was already chronicling her restaurant Chef and the Farmer in Kinston, North Carolina. That award-winning program has familiarized audiences with Howard’s point of view and with her husband and partner, Ben Knight, her parents and family, and staff. Many people first learned about Glenn Roberts and his preservation of endangered grains at his South Carolina Anson Mills operation through an episode of A Chef’s Life. Farmer Warren Brothers and his staffer Lillie Hardy are popular semi-regulars on the series. I was able to access a bushel of my mother’s childhood favorite apples, Hackworths, based on an apple episode of A Chef’s Life. In each episode of her show, Vivian Howard explores a local ingredient by going to the source. She then features a traditional preparation of the ingredient and goes back to her restaurant and “exalts” the ingredient with her restaurant’s culinary take on the basics. 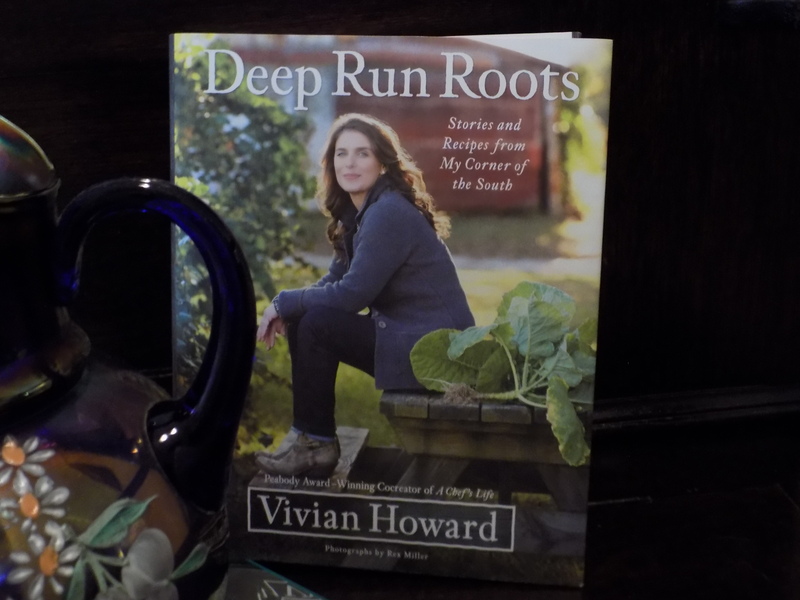 Vivian Howard’s long-anticipated Deep Run Roots: Stories and Recipes from My Corner of the South (Little, Brown and Company; 2016), with photographs by Rex Miller, hit the shelves in October. I bought it on the day of its release. Actually, I showed up at my local bookseller a day early and had to come back the next day to get a copy. Anyone who is familiar with the television show will be immediately at home with the packed cookbook. Each section focuses on an ingredient and features Howard’s essay (she’s an excellent writer, by the way) and a blend of recipes suited to every kitchen and skill level. When people who are familiar with Chef Howard find out that I attended Howard’s Friends of the Café dinner at the Factory, the first question is “Did she serve Tom Thumb?” I regret that she did not (although she did serve a version of her famed Cherokee purple tomato sandwich, so there!) but Howard aficionados know that Tom Thumb is a sausage mix stuffed into the cleaned and rinsed cavity of a pig’s appendix. It is unique, apparently, to eastern North Carolina where she grew up. Her Tom Thumb recipe comes from her father’s mother’s family. You can find the details in the book but I will never tackle that one. I’ll wait until I can taste Vivian Howard’s preparation of it one day. Howard’s book also includes her mother’s recipe for chicken and rice that she and her mother, Scarlett Howard, made famous on the show. I can vouch for that one. This is a Southern cookbook, but not one that treats the South like one big region where everybody eats the same fried chicken, ribs, shrimp and grits, collard greens, and gumbo. Instead, I interpret Southern cooking the way we understand French, Italian, and Chinese food: as a complex cuisine with variations shaped by terrain, climate, and people. So is Chef Sean Brock. His cookbook, Heritage, with photographs by Peter Frank Edwards (Artisan; 2014), synthesizes his Virginia heritage with his culinary training and his adult experience as the acclaimed chef of Charleston’s McCrady’s and of Husk, with locations in Charleston and Nashville. Sean Brock was the chef of my most recent meal at Friends of the Café in Florence. Now, after eating his meal and reading his cookbook, I feel like he might have been my best buddy in another life. Heritage is as compulsively readable as Deep Run Roots and each treads some of the same territory, albeit with somewhat different perspectives. Brock’s passion for farm to table seems even more compulsive than Vivian Howard’s and his gorgeous book is an educational text as much as it is an autobiographical and culinary one. Brock plays loose and free with his opinions on every page of Heritage. While Vivian Howard focuses each chapter of her book on a specific ingredient, Brock titles his chapters with subjects like “The Garden,” “The Yard,” “The Creek and the Sea,” “The Public House,” and “The Sweet Kitchen,” etc. and includes a plethora of applications for each category. I love anything pickled but have had a fear of the pickling process; Sean Brock and Vivian Howard have given me the courage to pickle, maybe. 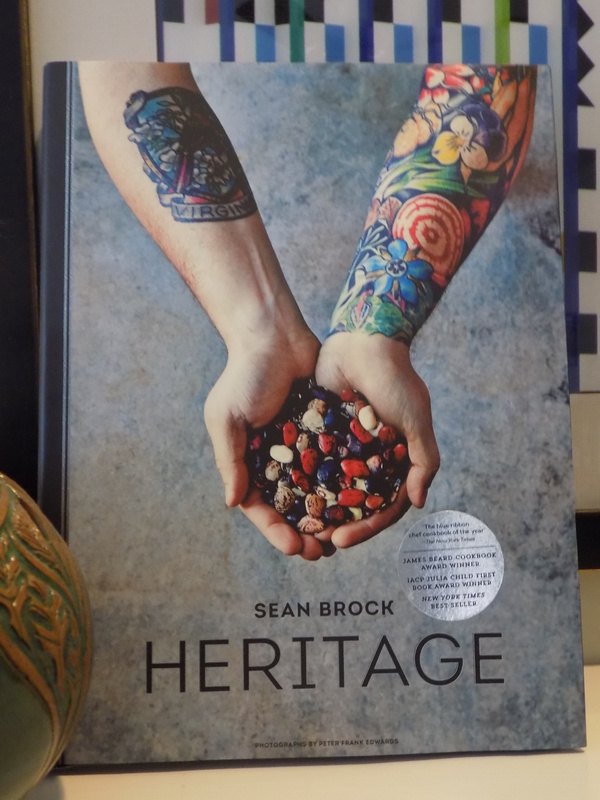 Sean Brock’s respect for his heritage, his ingredients, his colleagues, and his methods are contagious. I was already inquisitive about food and foodways and now I want to find out even more. I realize that questioning the growers, chefs, home cooks, and purveyors is not invasive but a way of preserving and “exalting” a culture and its ingredients. I already knew that but Heritage reinforced it. A few years ago Alabama native chef Scott Peacock moved to Marion, Alabama, and was interviewing older home cooks throughout the state in an effort to archive and preserve their methods and techniques. This is a mission that Brock and Howard exemplify and carry forward in their debut cookbooks. If you are a cook, or if you just appreciate thoughtful and well-prepared food with a human touch, these are texts you will cherish. This entry was posted in Southern cookbooks and tagged Alabama Chanin Friends of the Cafe, Anson Mills, Chef Scott Peacock, foodways, Glenn Roberts, Hackworth apples, Husk restaurant, Lillie Hardy, McCrady's restaurant, Sean Brock, Sean Brock's Heritage cookbook, Southern cookbooks, The Chef and the Farmer restaurant, Tom Thumb recipe, Vivian Howard, Vivian Howard's Deep Run Roots, Warren Brothers on November 3, 2016 by gedwardjourney.